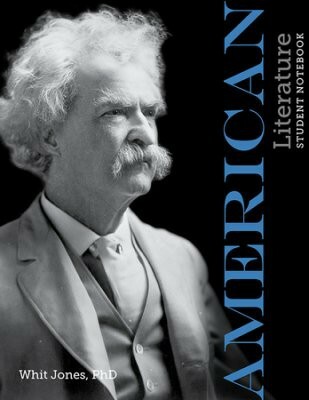 Now your students can explore the power and beauty of America’s greatest literary works. The student notebook is a key component of the American Literature course. Every study question from the textbook is included, with ample space for students to record their answers. Also, the notebook is where you will find the chapter tests, semester exams, and detailed, step-by-step instructions for writing insightful and persuasive literary analysis papers on Nathaniel Hawthorne’s short story “The Birthmark” and Robert Frost’s poem “Mending Wall.” This outstanding feature makes the American Literature Student Notebook invaluable preparation for future college coursework. This American literature homeschool curriculum for high school will teach students to analyze major works of American literature from a biblical perspective. This item is the Student Notebook only which is used with the American Literature textbook (sold separately, Item #2060) From Apologia. High School Level. Now your students can explore the power and beauty of America’s greatest literary works. The student notebook is a key component of the American Literature course. Every study question from the textbook is included, with ample space for students to record their answers. Also, the notebook is where you will find the chapter tests, semester exams, and detailed, step-by-step instructions for writing insightful and persuasive literary analysis papers on Nathaniel Hawthorne’s short story “The Birthmark” and Robert Frost’s poem “Mending Wall.” This outstanding feature makes the American Literature Student Notebook invaluable preparation for future college coursework. This American literature homeschool curriculum for high school will teach students to analyze major works of American literature from a biblical perspective. The course is authored by Dr. Whit Jones, a homeschool dad and professor at Bryan College. By completing this high school course, your student will earn 1 literature credit and 1 writing credit. This item is the Student Notebook only which is used with the American Literature textbook (sold separately, Item #2060) . From Apologia. High School Level.